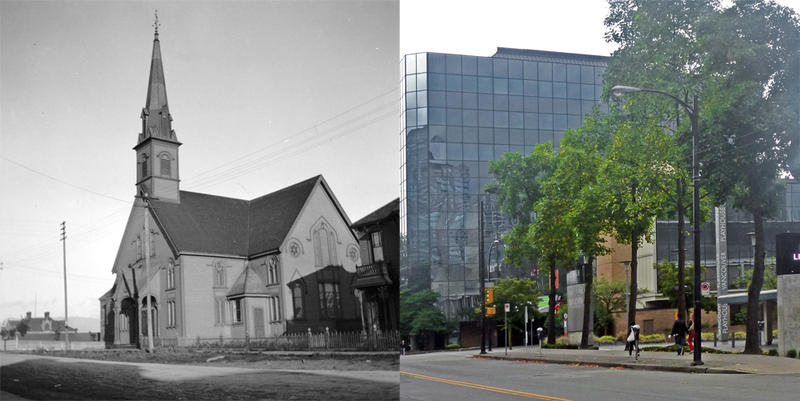 This church stood on the south east corner of Dunsmuir and Hamilton streets. It was designed in 1889 by Thomas Hooper, better known these days for his many workmanlike commercial buildings. However, four of the first ten buildings that we know he designed in the city were churches. 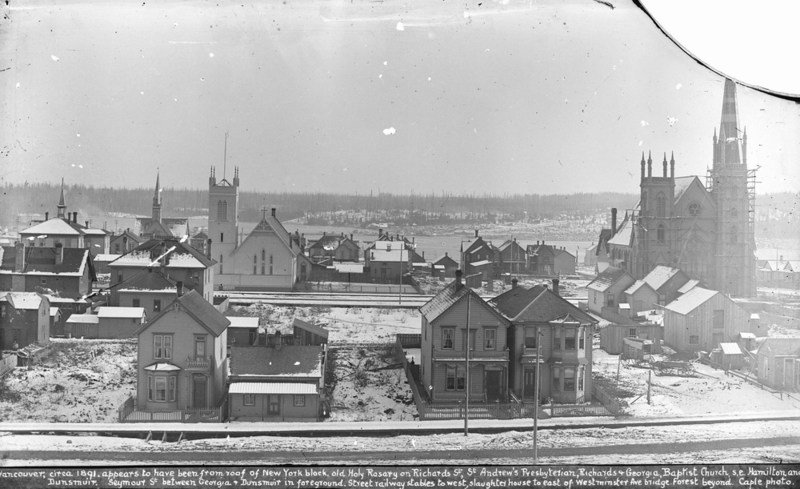 This early 1900s image shows that there weren’t too many houses – or any other buildings – in the neighbourhood when the First Baptist church was built. This wasn’t the first First Baptist Church – that was on the corner of Dupont (Pender today) and Westminster Avenue (now Main Street) but this Hooper designed wooden edifice was much bigger and could seat 800. 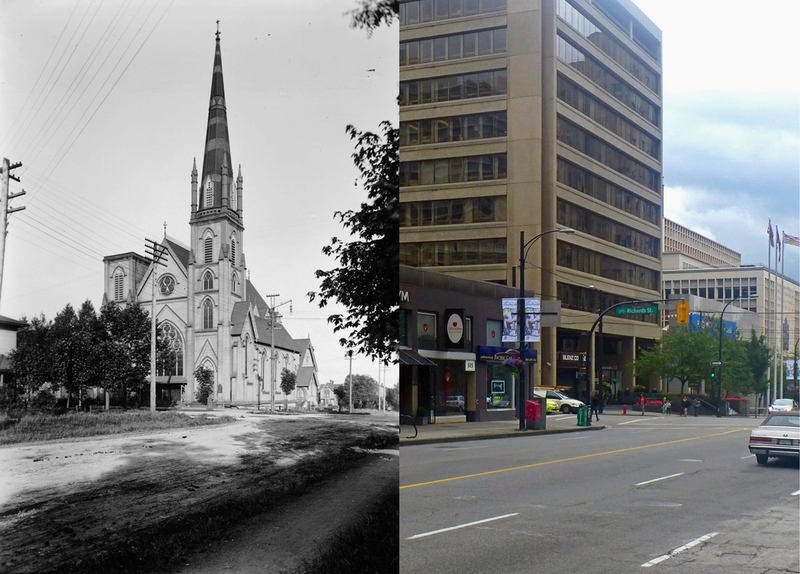 After only 14 years the church needed to move again, and a lot on the corner of Burrard and Nelson was purchased, although the congregation weren’t able to move until 1911 to the stone building still standing today. Today the Vancouver Playhouse occupies the site, although where the church stood includes the surrounding landscaping and driveway for the theatre. The main building in this picture is identified by the City Archives as Milne and Middleton’s. Actually that was different building – one that’s still standing today. This building is a late addition to Yaletown; it was built in 1948, and was first occupied in 1950 by R E Johnson and Co who dealt in plumbing and heating supplies. In this 1981 image there’s a public stenographer and a Mailing Services company advertising their presence. The building that replaced it in 2002 was technically a conversion, although clearly the Homer Street façade is almost completely rebuilt. It’s part of Rafii Architecture’s ‘Alda’ project that includes the new-build part to the south as well. To the north was another site that went undeveloped until 1998 when ‘The Grafton’ was completed (although at least one realtor would have you believe it’s a conversion). Designed by Linda Baker, it contains 27 strata residential units over office and retail. Next door is genuine conversion of a warehouse to residential uses, known as ‘The Ellison’. It was originally built for George Baker in 1929 and designed by Sharp and Thompson. We assume it’s the same George Baker who was a builder and who had been involved in building much of the area including both the Gray Block up the street and 1028 Hamilton Street. Howard Bingham Hill designed the 27 unit conversion and addition, completed in 2007 by the Holborn Group. For many years it was the home of the Ellison Mill and Elevator Co, although by 1950 it was multi-tenanted including National Carbon Batteries, Memba Pectin Co, Independent Biscuits, A J Sinclair’s upholstery supplies and J E Stark food distributors. We featured the two buildings at the end of the block (including the Gray Block) in a post we wrote last year. The warehouse on the right of the shot is the H S Griffith designed building built in 1910 for W R Arnold that we featured in the previous post. Inexplicably, there’s a vacant site in this 1981 image that isn’t the result of a demolition. No building was ever constructed between the 1948 warehouse on the left of the picture (1250 Homer) and the 1910 warehouse/factory. Today Rafii Architecture’s ‘Alda’ building is here; completed in 2002 with a combination of 59 residential strata units, office space and retail along Homer. It also incorporated the warehouse on the left of the picture, with a completely new façade. We saw the building on the right of this 1981 picture in the previous post. It was built in 1910 as MacPherson & Teetzel’s hardware warehouse and designed by Parr and Fee. The more substantial building next door was built in the same year for W R Arnold by Adkinson and Dill for $48,000. It was designed by H S Griffith and described in the permit as a reinforced concrete warehouse. The first tenant was Hamilton Smith’s ‘Smith Biscuit Co’. Mr. Smith lived in the Hotel Europe, on Powell Street, along the street from one of his rivals, the Mooney Biscuit & Candy Co, based in Stratford, Ontario. In 1907 Mooney’s advertisement claimed they were ‘the fastest growing business in the Dominion’, and had added a fleet of their own rail cars to ship their ‘Perfection Cream Soda’ biscuits around the country. H S Griffith was based in Victoria, having moved from England, and he established his Vancouver office in 1910. This warehouse, and another in Yaletown, were both issued with permits on the same day, and appear to be the first issued to Griffith. William Arnold was, in 1910, the Managing Director of the Dominion Trust Company who had also built a West Pender building through another subsidiary, also designed by H S Griffith, as well as the Dominion Building that they took on when the Imperial Trust ran into financial problems. It isn’t clear whether Mr. Arnold developed this warehouse as a personal project, or on behalf of The Dominion Trust Company. In a later court case (after Mr. Arnold’s death), the judge described him as ‘a man of endless speculations’. A couple of years after the construction of Dominion Trust’s portfolio of buildings the economy went into a ‘severe financial re-adjustment’ (as it was described at the time). The final straw may have been over-extended company finances on a planned harbour scheme on Lulu Island (that was never built), and the company’s liquidator concluded that Mr. Arnold had advanced a series of unauthorized loans that were very risky. The $5,752,232 of book assets were estimated to actually be worth under a million dollars. W R Arnold shot himself, aged 31, in 1914 in what was initially reported as ‘a bad accident’. An initial court judgement agreed that it was an accidental death, and his insurance company was to pay $100,000 to the Dominion Trust. However, the insurance company won on appeal, and the death officially became a suicide. In 1912 the Mooney Biscuit & Candy Co acquired the Smith Biscuit Co as part of their Canadian-wide expansion, allowing them to bake their branded biscuits in the west coast market, rather than having to ship them from further east. The First World War may have caused something of a problem for Mooney’s – by 1916 they were in receivership (which may be the reason for the VPL having a photo of their empty ‘melting pots’ from that year). The building was apparently vacant for several years, but in 1919 the Canadian Nut Co were here, and in 1920 they were joined by the Mainland Confectionery Co, managed by Chas. Rimmer. By 1924 the confectionery company were still here, but the nut company had been replaced by Ogilvie Flour Mills Co. Ltd. The Montreal-based millers retained the location (and soon replaced the confectionery company) for over two decades. (The archives have some great images of their delivery trucks for Royal Household flour at the warehouse). By 1944 they shared the building with a wholesale confectioners, McBride Jackson Ltd, and a commercial artist and printers, R H Storer & Co.
By 1981 when these images were shot, Moore & Middleton occupied the building. The company was a manufacturer of knitting yarns for Cowichan and Icelandic sweaters and North American distributor of knitting yarns, needlepoint, sewing supplies, laces, trims and hobby crafts; it was dissolved in 1985. Today the building has office space on the upper floors and Yaletown’s last billiard hall on the Hamilton Street loading dock side of the building. This modest warehouse has been around in Yaletown for over a century. Inaccurately labeled in the archives as 1090 Homer Street, when it was photographed in 1935 it was already a 25-year-old building. It was built in the flurry of construction when the CPR released the area near their tracks for new wholesale facilities for the fast-growing city. The permit says it was designed by Parr and Fee for MacPherson & Teetzel and built for $2,500 by Smith & Sherborne. Undoubtedly it cost more than that – so either that was just the foundations, or a digit was missed by the clerk. MacPherson & Teetzel were a relatively new company, formed in the fall of 1907, but founding partner D MacPherson had already sold out to his partner in 1908 – although Archibald Teetzel didn’t change the name of the business when he took sole control. He was a fairly young entrepreneur, having been born in western Ontario in 1880. He worked at a general store for 8 years, before moving to Vancouver in 1901 when he became a traveling salesman for a firm of wholesale grocers for six years. He was married in Revelstoke in 1906, and settled briefly in Nelson in 1907 before selling out a few months later and moving to Vancouver where he shifted to the wholesale hardware business. In 1912 he added a new business to his portfolio, the Pacific Rubber Tire & Repair Company Ltd on Granville Street. By 1928 MacPherson & Teetzel still occupied this building, but were now known as Elliot, Teetzel and Wilson Ltd. They seems to have gone by 1930, when the building was empty, replaced briefly by Dominion Canners (wholesale) before Dunlop took the premises. Today, unusually, there’s still a 2-storey office building (3 storey on Hamilton) – with no additions to the height or conversions of the space on the loading dock to restaurant. The permit for this building was approved in 1914, and it says the address of the building was 531-537 Homer Street. The 1914 Street Directory says the address was 515 Homer Street, but two years later it was listed as 535. The building was identified from 1914 on as the Eagle Temple, and the permit was issued to Eagles Hall Building Co for a $55,000 building designed by Emil Guenther. It replaced a pair of houses that pre-dated the turn of he 20th century. The Fraternal Order of Eagles was one of many in the city; the roots of the organization go back to a meeting of six theatre owners who met in Seattle to discuss a strike, and agreed to form “The Order of Good Things”, later changed to reflect the bald eagle emblem. Today the organization’s aims are “to make human life more desirable by lessening its ills and promoting peace, prosperity, gladness and hope.” The Vancouver Aerie #6 was founded in 1898-9. The Fraternal Order of Eagles were still identified with the building in 1933, but a year later it was known as Victory Hall, a name it retained through the Second World War. (The Canadian Channel Island Society collected items of clothing here to help support evacuated Guernsey children living in England for example). The main floor tenant changed often: in 1933 it was Remington Typewriters; in 1945 an estate agency. From 1946 to at least 1955 it was known as the Parsons Brown building, the offices of an insurance company with a series of other office tenants including manufacturers agents, an insurance map maker and an advertising agency. By 1975 when this picture was taken it was known as the Vancouver Resource Building. The building was still standing in 1981, but had been demolished by 2001. It was replaced in 2004 by Belkin House, a completely new facility for the Salvation Army with over 100 rooms but capacity to have over 200 people sleep in the building. The scale of the new building is more appropriate to the adjacent West Pender Building designed by H S Griffith in 1912.